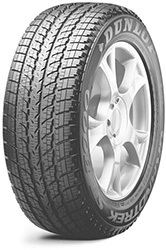 An all season high perfomance SUV tyre from Dunlop. The Grandtrek ST 8000 has been designed with perfomance vehicles in mind. The ST8000 comes in a range of sizes but most have the more sporty low profile option, designed to give a more sporty look to the vehicle and also to increase the handling. A long tread life and durability in the wet can be put down to the silica compound used during the manufacturing, along with a directional tread pattern.